Serious Cubase users should take a similarly serious look at the MR816 devices, as they have significant advantages over generic audio interfaces. Excellent Cubase integration. Quality interface. Pro-level EQ and reverb. Cubase AI included. Plug-in mode VST3-only. No MIDI. Quite expensive. The problem with your standard computer music setup - computer, audio interface and software - is that the freedom to mix and match whatever gear you like leaves hardware and software designers struggling to integrate truly advanced features. However, now that Steinberg is owned by musical equipment giants Yamaha, the opportunity has finally arisen to do exactly that at the core level with its Cubase DAW. Wisely, Steinberg has chosen to combine DSP-fuelled audio interfacing with extensive software-linking to Cubase (version 4.5 and above). The first devices in this new range are the MR816CSX and MR816 X 'advanced integration DSP studios', and it's the more powerful CSX variant that we have here. The X edition is essentially the same but minus the Channel Strip DSP effect. Strip away all the Cubase integration-related extras and the MR looks much like any quality FireWire interface. It's a 24-bit/96kHz-capable unit with a total of 16 ins and outs (eight analogue and eight digital in each direction). There's a full complement of eight class-A mic preamps (using Yamaha's D-Pre design), and the first two channels also include instrument inputs and unbalanced pre-conversion insert points. Both coaxial and optical digital connections are included, and the eight digital channels can be allocated as ADAT, S/PDIF, or split (six ADAT, two S/PDIF). Other connections include word clock in and out, twin FireWire (you can daisy chain up to three units) and two independent headphone outs on the front panel. Surprisingly, there are no MIDI connections. The front panel offers a gain knob, an LED level indicator, and 26dB pad and phantom power switches for each mic pre. "Unfortunately, since Steinberg's own Cubase and Nuendo are currently the only DAWs to cater for VST3, you won't actually be able to use the effects in other programs"
Features include near-zero latency routing and monitoring, and CoreAudio (Mac) and ASIO (PC) drivers. You can use the supplied MR Editor application to apply the device's DSPs to the analogue inputs, and options include the Channel Strip insert, REV-X monitoring reverb, low-cut filter and phase reverse. You can use the two front-panel encoders to access phones levels, master level, Morph and REV-X settings. You can load up the MR's Channel Strip and REV-X as plug-ins within your DAW, providing it supports VST3. Here, certain instance limits apply, the options being: eight mono instances; four stereo; six mono plus one REV-X; or three stereo channels plus one REV-X. Unfortunately, since Steinberg's own Cubase and Nuendo are currently the only DAWs to cater for VST3, you won't actually be able to use the effects in other programs until/unless their developers add VST3 support. We suspect that the vast majority of MR816 buyers will be Cubase users, and if you're using a version with Advanced Integration (4.5 and onwards), then you can ignore the MR Editor entirely as all its functions are built into new, dedicated windows within Cubase. This opens up some great new features, and in case you don't already have Cubase, there's a version in the box. As well as the routing and mixing options, the DSP effects are accessible directly from Cubase. The Channel Strip can be used to effect the input signal or purely for monitoring, whereas in this mode the reverb is for monitoring only. The only real catch is, you can't do both at the same time. Of the Cubase-specific features, the input section of the extended Cubase mixer offers direct access to the MR via the Hardware tab. Options include Phase Reverse, Low-cut Filter, the Sweet Spot Morpher and Compressor Drive, plus headphone and REV-X send levels, and effects routing. You can also open individual windows for the Channel Strip and REV-X. The device ties in with the Cubase Control Room, so with hardware monitoring enabled you can use the Studio Send facility to configure headphone mixes with near-zero latency. The new MR Hardware Set Up window in the Devices menu lets you configure routing for the MR's headphones and the REV-X monitoring effect. The final Cubase-only feature is Quick Connect. By selecting one or more audio channels in Cubase and hitting a blue selector button, that particular input is automatically routed to said channel or channels. 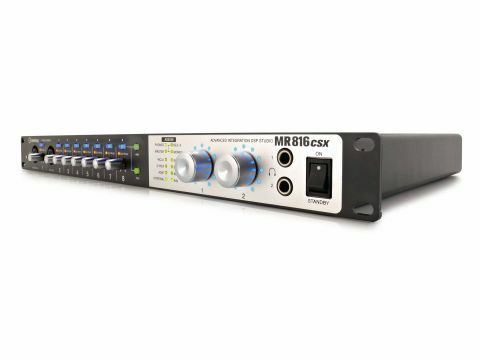 From a purely Cubase perspective, we found that the MR816 CSX worked superbly well - we can't think of any other native system that achieves this level of integration. So what are the downsides? First up, the lack of MIDI means it doesn't quite cover all bases. Also, as mentioned, the DSPs can't be used in plug-in and input effect mode at the same time. Plus, as it's VST3-only, the plug-in effects are Cubase/Nuendo-only for the time being. However, the biggest drawback has to be for non-Cubase users, who will be looking at this unit and wondering why they can't enjoy this level of integration with their own system. Of course, the answer is that they can, as long as they switch to Cubase, which would no doubt be music to the ears of both Steinberg and Yamaha.